Earlier this year, Maya Granit made the move from our wholesale jungle to the real jungle of Belize to work as the Managing Director of Maya Mountain Cacao. Here, she recounts what it’s like working on the other side of the chocolate supply chain. 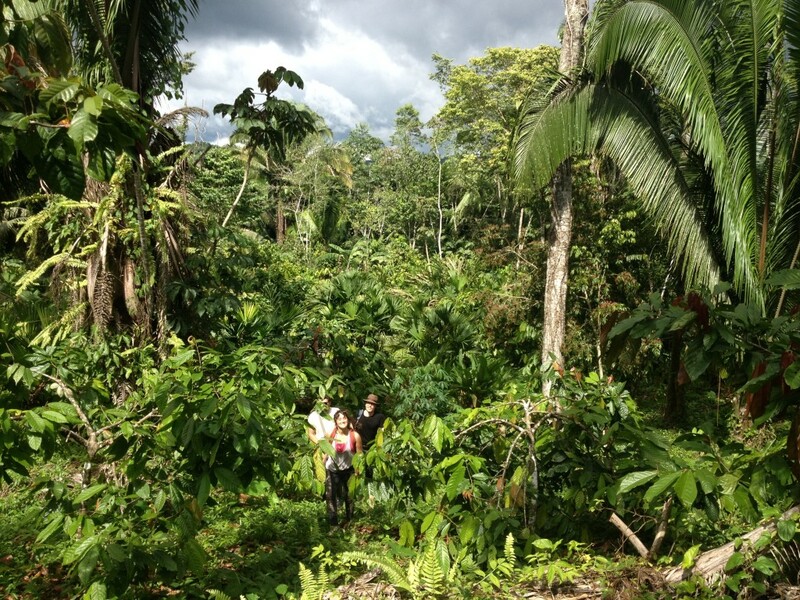 Maya Mountain’s next project—transforming this land into an organic, cacao-based agroforestry demonstration farm. My name is Maya. About six months ago I made the jump from the chocolate maker side – working as head of wholesale for Dandelion Chocolate – to sourcing at origin in Central America. Today I’m the managing director of Maya Mountain Cacao, located in sunny, cacao-filled southern Belize. Maya Mountain Cacao (MMC) works with about 330 smallholder Belizean cacao farmers, and connects them to awesome chocolate makers in the USA and Europe – like Dandelion Chocolate! The Toledo District of southern Belize—where MMC sources the vast majority of its cacao—is populated primarily by indigenous Q’eqchi and Mopan Maya. A staggering 69% of the population is at or under the regional poverty line, and most of the farmers we work with have about 1-3 acres of farming land. Until recently, it was extremely difficult for farming families to get their cocoa to the market, and for them to secure a fair price once they made it there. Maya Mountain Cacao was created with the mission of building a more farmer friendly model, and we’ve been learning as we go. Since we began, we’ve been able to generate up to 400% income increases for farmers through improved market access, micro-credit opportunities, and 100%+ yield improvements on farms through a combination of technical services and market incentives. The longer we are here, the more impact we’ve been able to generate in the local community, and in the international chocolate market. Today we directly serve six customers, with over 70 on our wait list! Needless to say, we’re working hard to increase our production. This year we’re helping farmers plant 82,000 new cacao trees, and providing technical assistance and microloans to over 165 farmers to make sure new and existing farmers can make the most of their land. But, Belize is a tiny country. While we have all the cacao genetics, rich soil, and motivation to increase our production, I don’t think we’ll ever be able to satisfy the enormous international demand. 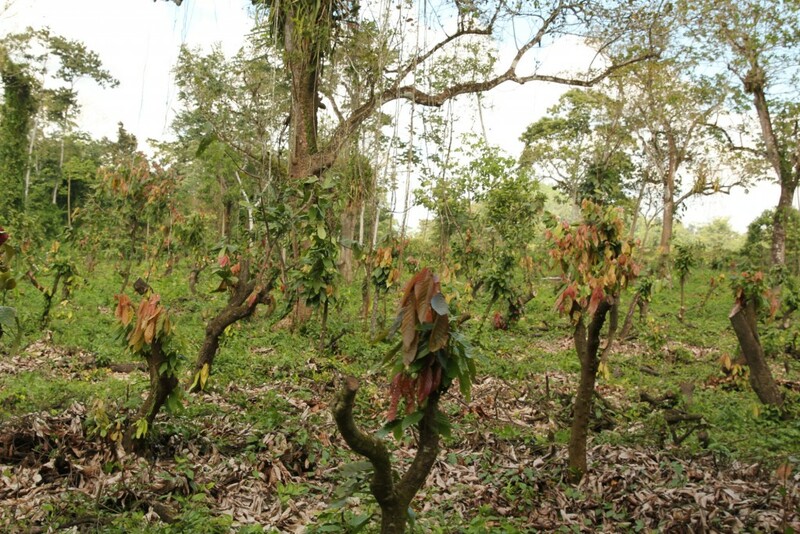 In an effort to increase our production, and provide a new approach to Belize’s cacaopportunities, we’ve recently taken on one of our most important initiatives to date: the development of a 120-acre cacao agroforestry Demonstration Farm. Over the past year, we’ve been working with local farmers, their families, village leaders, and other key partners to get geared up to build this industry-changing, environmentally conscious farm. We’re all joining together to transform 120 acres of jungle land – which was previously at risk of being destroyed for slash and burn farming – into a world-class productive, certified organic, cacao agroforestry farm. Since I arrived in Belize, MMC has taken huge steps to protect and develop this land; we actually just finished planting the first 30 acres of cacao (along with plantains, mahogany, cedar, and other trees) this week! Communities have already seen the benefit of the Demonstration Farm, which provides more than 20 jobs on the farm and 20 jobs working in nurseries. Ultimately, the Demo Farm will be a source of pride and economic development for the country of Belize, as well as a practical tool used for local and industry-wide cacao farming education. Not to mention, it will increase our annual production capacity by over 50%, bringing more of Belize’s cacao into chocolate bars all over the world. We’ve already made a good deal of progress in our work, but we need to continue raising funds in order to meet our ambitious goal. That’s why we’ve launched a Kickstarter campaign, Indigenous Innovations: Revolutionizing the Cocoa Industry in Belize. We need to raise $40,000 in the next 30 days to make it happen, and we have some delicious rewards for the people who help make it happen! Belize is just a drop in the bucket in the world’s annual cocoa production. However, cocoa farmers and buyers globally have an opportunity to learn from the lessons set by our relatively tiny farming community. By combining traditional farming practices with modern science, the community is able to preserve their customs and heritage, while driving value from the modern market. If we set up more training centers globally, which balance modern science and traditional practices in a similar way, we would enable more farmer communities to benefit from this growing industry. Moreover, from this example we’ve seen what happens when cocoa farmers and chocolate makers collaborate directly. By removing middlemen and shortening the value chain, both farmers and buyers increase their value and quality, ultimately bringing large-scale social impact to farming communities and driving systemic change in this tasty but troubled industry. Living in Belize has been an exciting whirlwind of cacao farming education, and so much has happened in the last few months. The main lesson I’ve learned is that you simply can’t take a one-size-fits-all approach to cacao sourcing. Every origin, whether it’s Belize, Guatemala, Panama or Bolivia, has a unique set of challenges and opportunities. Here in Belize, we’re excited about high quality cacao, and farmer and industry education. We’re making an impact in the local community by developing an industry together, from the ground up… from seed to tree to bean to bar, if you will. From everyone on the MMC team, we hope you come visit us! We have a lot of trees to plant on our farm, and some great hammocks, waterfalls, and Belikin beers to enjoy when you’re done with your hard work. See you soon! It’s almost the loviest day of the year! But Lindsay and I were hit with a wall of eye rolls and groans when we started talking about planning a romantic Valentine’s Day event. Instead, we’re going to have a late night, chocolatey bash. We’re looking forward to seeing you at the factory the night before Valentine’s Day so that we can all properly celebrate love and chocolate together! Party After Dark Chocolate! Join us at the factory as we usher in Valentine’s Day with an after hours celebration. We’ll have champagne, chocktails, delicious desserts, and dancing tunes. You’ll be able to custom letterpress Valentine’s cards on hand crafted paper courtesy of Shotwell Paper Mill. And of course, we’ll show you around the factory so you can sample cacao as it transforms from bean, to molten chocolate, to bar! Come as a group of three to take advantage of the Third Wheel discount. 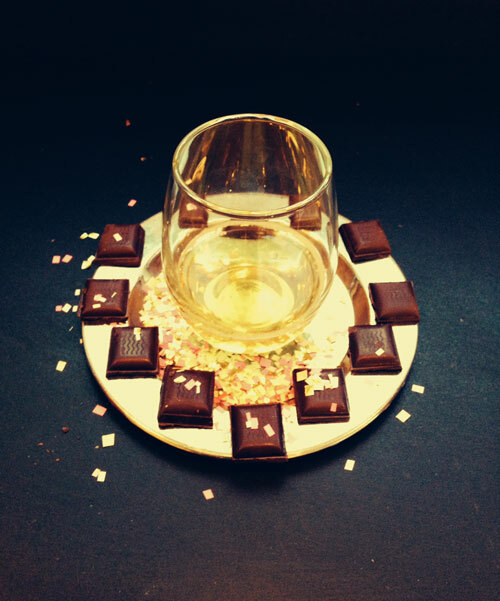 Your ticket includes two drink vouchers and a delicious selection of chocolate treats! Get your tickets on www.eventbrite.com (tickets won’t be available at the door). It took a lot of editing, but here are the top five reasons this is our favorite chocolate chip cookie ever to have emerged from the Dandelion Chocolate pastry kitchen. It has an internal hazelnut-chocolate reservoir. This single cookie is actually two, separate cookies smooshed together. The casually sprinkled salty flakes. It has an inspiring balance of chocolate and cake-y goodness. Did we mention the homemade nutella? 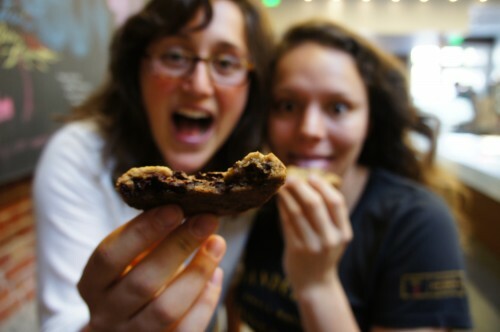 This cookie is made by our one and only Meredyth Haas and will only be available from now until Sunday, August 11th.